In Martin Scorsese’s new religious epic, two priests (Andrew Garfield and Adam Driver) journey to Japan to locate their mentor (Liam Neeson) only to face violence and prosecution against Christianity. Silence is unfortunately one of the more disappointing films this awards season. Some have acclaimed it, but I felt disappointed and unsatisfied when the film ended. Scorsese does a great job with the film’s technical aspects, using natural sound beautifully instead of music in any scenes, and the cinematography and set designs are great as well. Andrew Garfield delivers a great performance, even though it’s emotionally hard to connect with his character. Liam Neeson also delivers a very good supporting performance in a key role. However, I was disappointed in the lack of strength that the film’s theme had. Most historical films know how to pull you in with the topic they focus on, but besides some gripping and powerful scenes involving torture and violence, Silence has nothing to offer throughout its runtime that’s worth the price of admission. The film’s 2 hours and 40 minutes long, and despite most films that run as long and actually feel worth it, Silence feels 20 minutes too long with an epilogue that drags on and an unsettling climax. The historical topic felt very interesting and strong but I didn’t feel like it reached out to me as much as the trailer did. The film slows down way too often and some scenes feel repetitive or don’t advance the plot at all. When the scenes do feel important, they’re often powerful and incredibly shot, but something about the film’s religious and historical themes did not impress me, although I could tell Scorsese cared about making this film with all his heart. I’m surprised, however, that this is the project he’s been most passionate about making for the last 20 years, as he’s conveyed far more interesting topics in more impressive films than his latest. 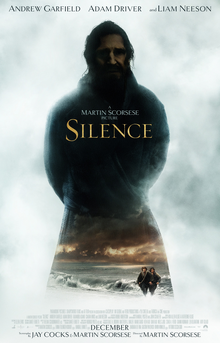 Silence is beautifully shot and directed, with great performances from Andrew Garfield, Adam Driver, and Liam Neeson, but its themes and plot feel hollow and I couldn’t connect with almost anything that happened. This film may reach out to you and you may end up loving it, but I personally was not impressed by the emotional connection the movie was aiming for. There are better films out there to watch in theaters and on Scorsese’s resume. I agree that the movie has flaws (Garfield and Driver should have had each other’s roles, as several critics have suggested) but I also think it’s a much more important movie for our times than practically anything I can think of since “Children of Men” and I’m glad that the money and support still exists for such films. I agree with most of your review. However, I think that you have been a bit too generous in awarding 3 slice pizzas. Two slices would have been more than enough. I was utterly bored throughout the movie. Totally superfluous and waste of time as far as I was concerned.